Money in the Garage: A vintage baseball card scores big! A vintage baseball card scores big! BIDDEFORD, Maine — A rare 148-year-old baseball card discovered at a rural Maine yard sale has been auctioned for $92,000. The card depicting the Brooklyn Atlantics amateur baseball club was sold by Saco River Auction Co. in Biddeford Wednesday night and it drew plenty of interest. Bidding started at $10,000 and quickly rose to the final $92,000, which included an 18-percent premium. Winning bidder Jason LeBlanc of Newburyport, Mass., said he bought the card as an investment for his young son in the hope of selling it for a higher price when his son gets older. If the price had gone up one more time, he said he would have dropped out of the bidding. A $92,000 yard sale find! A Maine man who doesn’t want to be publicly identified found the card inside an old photo album he bought while antique picking in the small town of Baileyville on the Canadian border. The man bought the photo album, old Coca-Cola bottles and a couple of oak chairs together in a single purchase for less than $100, said Troy Thibodeau, manager and auctioneer at Saco River Auction. The card isn’t the same as a modern-day baseball card, which became common in the 1880s. 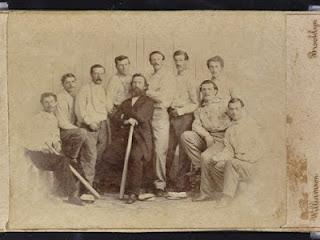 Rather, it’s an original photograph from 1865 mounted on a card, showing nine players and a manager. The Library of Congress said last month it was aware of only two copies of the photo. The other is in the institution’s collection. In its book “Baseball Americana,” the Library of Congress calls the item the first dated baseball card, handed out to supporters and opposing teams in a gesture of bravado from the brash Brooklynites, who were dominant and won their league championships in 1861, 1864 and 1865. It was impossible to predict what kind of price the card would fetch because of its rarity, Thibodeau said, but he guessed before the auction that the winning bid would fall somewhere between $50,000 and $500,000. The priciest baseball card ever is a 1909 Honus Wagner card, which sold for $2.8 million in 2007. Tom Bartsch, editor of Sports Collectors Digest, said $92,000 is a good price for a pre-war card without a Hall of Famer’s picture. Chris Ivy, director of sports auctions for Heritage Auctions, said there’s also only a small pool of buyers for such an esoteric item. Both said the story of the card’s discovery remarkable is a reminder to collectors of all kinds that a rare find can easily be missed among otherwise unremarkable items. “It’s what keeps those treasure hunters out there going,” Ivy said. Wow! After paying the auction house their commission, the owner probably cleared somewhere around $75k. An incredible profit on a $100 investment! If that story doesn't make you go through every old book you ever bought at a yard sale, I don't know what will? While you may not have the next big auction house find, it's always worth a look. Not long ago, I was watching an episode of Storage Wars and noticed Brandy thumbing through every single book found in a storage locker. On another episode, Darrell found a bunch of cash stashed behind a picture frame. Books, picture frames.....you just never know where people hide their cash and valuables! I've never stumbled across a hidden find like that, but you can be sure I'll keep looking! Since I don't have a good "hidden treasure" story, how about you? Ever find something good stashed inside one of your yard sale finds? Susie Q- You found five dollars in the pocket AND sold the shorts for $50?! I love that!! I know what your saying about our hobby, sometimes I have to check myself when I am with family-don't want to become annoying or sound braggadocios, y'know? But other times family/friends will ask me about my latest score and love to hear my stories. (That what gave me the idea for this blog)...pretty funny. I agree with your husband, unlike some other hobbies that cost money like golfing or fishing, with this hobby we make money! It's awesome! Veronica- $100 dollars...Nice! Purses are a natural place to look for hidden treasures. And you know what? You just jogged my memory. A few years ago Mrs. Dude found a small item in a purse too. She bought the purse at Saint Vincent's and found it inside. I later sold it and made some nice money-may have to make that my next blog piece. Thanks for the recovered memory....Dude! Love that find! What a hoot! Bet your son was thrilled with all those dimes! YES - start a blog!! I can't get enough reading of everyone's finds! Love to hear these great Flip-N-Find stories! I'll be your first follower!! Pam-That's awesome. You made a profit of $7 bucks without even having to sell the plane! Maybe a previous owner was using it as a piggy bank? Ha! Thanks for liking the blog. I second Susie's comment. If you start one let me know so we can follow. Thanks for writing in...Dude! I sometimes buy cards (birthday, get well...) etc. at yard sales. Well when I pulled one of the birthday cards out of my stash I didn't realize it had been used. When I opened it it had been given to someone as a birthday present and it still had $50 in it. So I usually check through the cards now. Still looking for any long forgotten birthday presents. Donna- Ha! That's great...I got to put birthday cards on my yard sale search list now. Hope you find that present too. Thanks for sharing your story....Dude! Well, one time I bought a cute little upholstered chair from a lady who bought out storage units. This was about 1998. When I took the cover off to wash it, I started yelling. My husband thought there was a snake in the backyard! There was $100 in 20's from 1974. I told the lady who sold it to me, in case there were any other chairs that came with it. From then on, every time the lady's assistant saw me coming, she said, "Don't sell her any more chairs." Lol. Nina- I love it! Stashing the money in the seat for safe keeping is something my grandfather might have done...too funny! I am checking seat covers from now on...Ha! Thanks for sharing the great story...Dude! I saw that story late last night, thanks for reminding me. It definitely blog worthy. UN-freaking-believable! Right? Thanks again, I am gonna use that one....Dude! Glad you can use it. When I read it, I instantly thought of you and this post.